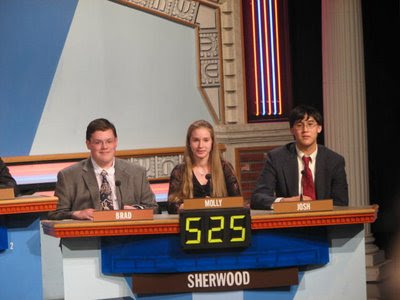 Forgive my bragging… but my brother’s son, Brad, won a soon-to-be-televised match on It’s Academic, a long-running, DC area, high school, TV quiz show. This is even more of an achievement for Brad because he is the only sophomore selected for the team; usually only seniors win the honor to be on TV. But Brad is simply a freaking genius – and he’s handsome and sweet as can be, too. Plus he’s like 6’3”! If I weren’t his aunt and 35 years too old, I’d date Brad in a minute. I’m very proud, as you can tell. :-) Brad is the dude on the left (which won’t be surprising if you’ve ever met my brother! ).